After a pleasant breakfast at Tom Phat we were keen to return for dinner. It didn’t take us long to come back – the pull of this Asian hub on Sydney rd always draws a crowd for dinner. We started the meal with a mix of starters. We’re the kind of people that have difficulty choosing what we want from a menu, there’s always so much we’d love to try. We compensate by ordering a bit of everything and the strategy works well at Tom Phat. 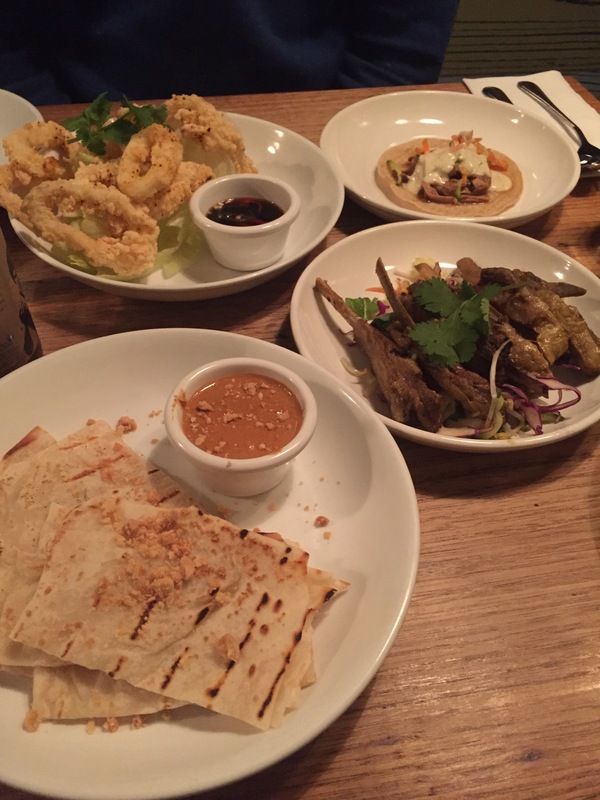 We went for the roti and satay, the salt and pepper squid, lamb rib as well as a single soft taco. The satay was all about the peanut. It was thick, chunky and full of flavour. We loved the feel of getting in with our hands and just smothering the roti in the sauce. Meanwhile the ribs were juicy and tender, sticky with a rich flavour. Eating with your hands gives a homely and relaxed feel to your meal. Finally the squid was salty and light. We prefer it be a bit darker but the squid was fairly well cooked. The chilli salt hit the right balance of warmth and kept us reach back for another. After absolutely knockout starters we were keen for the main course to arrive. Unfortunately we were waiting for what felt like a very long time. When you think it’s been too long a wait it’s usually the case and it was a downer on the flow of the meal. 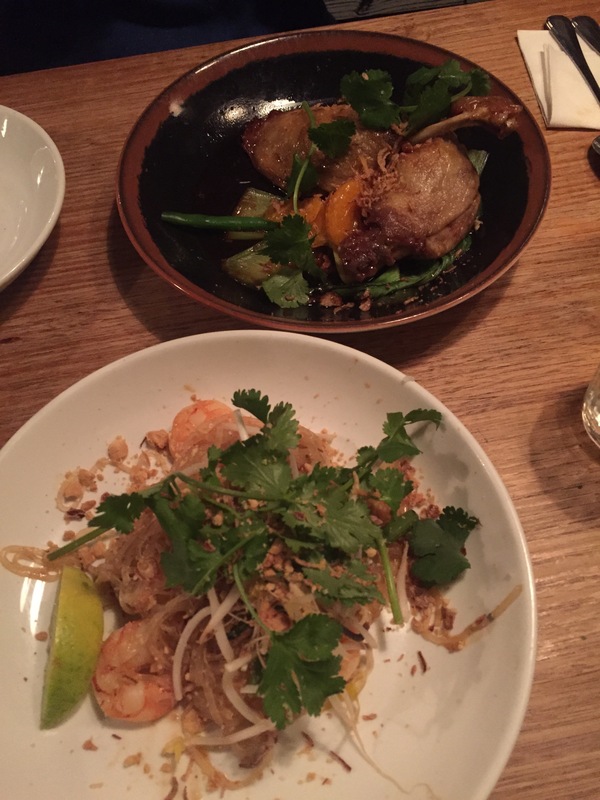 Our meals showed up eventually, a classic pad Thai and a duck curry. Both dishes were presented with a casual care. The Pad Thai had a nice citrus and funky flavour to it as well as textural chunks of nut. We would have preferred there to be more prawns and a little less noodles. The duck curry was divine. The meat was perfectly cooked on the bone, tender and caramelized. The sauce was sweet and salty and we loved the freshness of the book choy. The two meals were amply sized and we left feeling comfortably full. While the mains were good it was the starters that were the real knockouts. Tom Phat offer some great Asian food in the heart of Brunswick. They’re great for small groups but don’t have much space for larger groups. If you’re going on a Friday or Saturday be sure to get there early or expect a wait! I find that the better Asian places to eat are the smaller ones. There is a small Thai place in Mitcham called Chefs thai and it is the best I have ever tasted.. Only a few tables run by a Husband and wife team but OMG! !